This story is basically a doomed war time love affair. 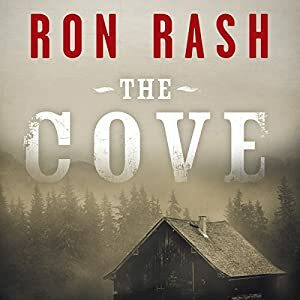 Laurel Shelton and her war wounded brother Hank live in the cove, a dark forboding place in the Appalachian Mountains that their now dead parents had got cheap as no one else wanted it and which locals still dread. One day in the woods she finds a stranger, stung almost to death by yellow jackets and brings him home to their cabin. He cannot speak, but once recovered stays, helps around the farm and their love blossoms. But his past catches up with them all as Chauncey Feith, the local army recruiter, whips the town into a patriotic fervour, hunting down German sympathisers, getting German Professor Mayer bannished from the college campus, commandeering German books from the Library, setting up the boys brigades, and finally organising a big shindig as the local town prepares to welcome back its wounded local hero, gassed by the Hun. The story is well written, with good hooks along the way which are not explained but which lead the reader to the outcome of the story very well. The language is lovely, depicting time (towards the end of WW1) and place well (Appalachian Mountains in rural Carolina near the Tennessee border). There were lots of references to plants I'm not familiar with but which served to give the idea of a pre-war rural idyll with undeveloped, unspoilt countryside. Rash also portrays the hard life of the agricultural inhabitants in such a backwater, ignorant and bigoted, where the lynch mob rules whether targetted at those with a birthmark who are deemed to be a witch (Laurel Shelton), or of those of German ancestry who are deemed to be spies. Sadly one could make parallels with views held in some quarters about muslims today, and as we are shown in the Prologue to the story, the insular nature of such locations lasts on. I'm really not a fan of American women readers – usually their voices are too brash, too high pitched for my ears, but this one was OK.